The math department at the high school where I teach is big into stations. If the concept is new to you, here’s the lowdown: On a station day, several learning centers are set up around the room and students circulate among them. Montgomery County schools in Maryland has published details. From what I’ve seen, stations are particularly good at providing opportunities for reteaching and practice, in addition to acceleration. The key here is that stations are useful as a differentiation tool. According to the MCPS folks, you should use assessment data to break students into groups. Not all students will visit all stations and time at the teacher station will differ based on the data. you need an assessment tool or record of students’ work in the stations — they need to turn something in. I’m thinking a culminating question at each station that has no solution posted makes a lot of sense. Your time spent in planning stations is huge. Not only must you plan approximately three activities but you must also provide differentiation for each group. This could mean upwards of six times the work in advance. This time is so worth it! Do I even need to say it beats the heck out of lecture or drill-and-kill practice? I saw that you are associated with Georgia. I too am in Georgia and am a fan of your stations ideas. I am in the process of gifted certification stuff and have been a fan of stations as as student and love the idea. However, here’s a few questions I have about the stations … does your school have stations that stay up all year or do they have stations that change by unit? topic? semester? grading period? What seems to work best? Looking how to best incorporate it into my classroom, but want to get some feedback first from “seasoned stationers”. Stations come and go in my classroom based on the topic. I generally prepare them on posterboard and attach them to the walls around the room. In a 45 minute work period, I would typically create 3 or 4 stations. About the station questions: I often want repetition so that students can practice a skill semi-independently. I usually cover the answers with a piece of paper taped on so kids can check their answers at the end. 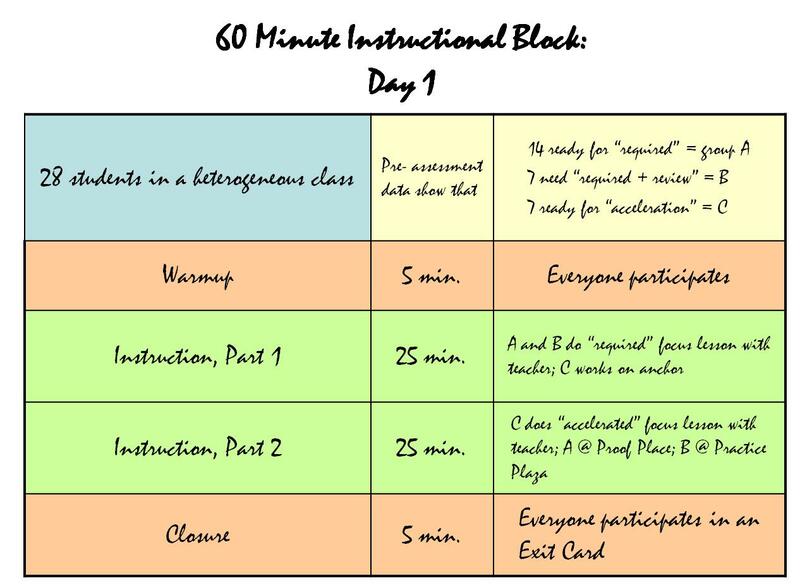 You can build differentiation into station days several ways. 1) put easy, medium, and hard labels on every problem at each station. Encourage student choice. Students visit every station but only do the problems they “want”. 2) Build more stations than kids have time to visit. Make a “hard” station for accelerated students. I like to do station days as a way to work in remediation/reteaching. One station is “teacher time”. You visit it as needed and we also practice. Cool. That helps. Are you currently teaching in the Atlanta area? I would love to have you come into my classroom one day and check it out. Would love to hear how to make my stations work even better. The Maryland link had gone bad since I wrote this post (it’s updated!). That link contains details on the researcher whose work they based their work on. Carol Ann Tomlinson is her name. http://www.montgomeryschoolsmd.org/curriculum/enriched/staff/classroom-strategies/stations-math.aspx Unfortunately, I don’t have any more research or statistics. Everything I know is anecdotal.